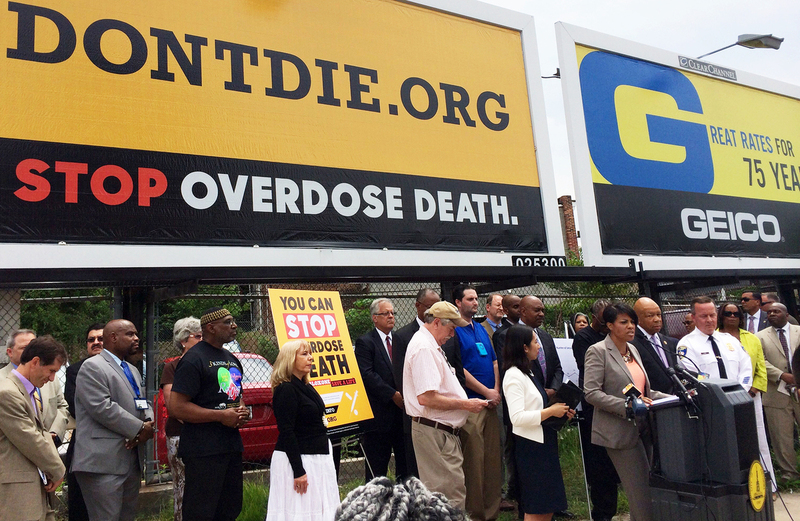 Baltimore Fights Heroin Overdoses With Antidote Outreach : Shots - Health News Fatal overdoses are rising among an estimated 19,000 people who use heroin in Baltimore. To curb deaths, the city's health commissioner aims to make an antidote widely available to drug users. 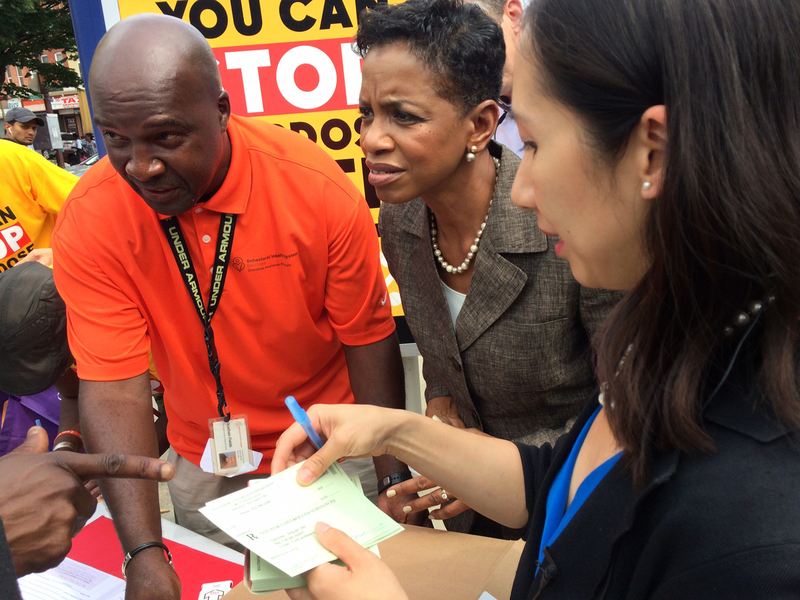 Health worker Nathan Fields (left), Rep. Donna Edwards and Dr. Leana Wen show people how to use naloxone on a street corner in Sandtown, a Baltimore neighborhood where drug activity is common. There were 104 overdose deaths in Baltimore during the first quarter of 2015, a 49 percent increase over the 70 reported during the same period in 2014. As chair of a committee that has a state mandate to review every fatal drug and alcohol overdose, Wen hears about each and every overdose victim in the city. Each month, the health department, police department, and other agencies that are part of the committee conduct a detailed examination of every death. The kickoff of Baltimore's Don't Die campaign in July, which coincided with the release of a report by the mayor's Heroin Treatment & Prevention Task Force. "These are difficult meetings to attend," Wen says. "You're literally hearing about a person's life, seeing their spiral downward, seeing how they did fall through the cracks ... fell through our fingertips and now is dead." The committee's examinations show that many of the victims are people who had sought care in hospital emergency rooms, some as many as 50 times. Many are repeat drug offenders who had been in and out of central booking and may have been to jail as many as a dozen times. Wen sees those points of contact as opportunities to reach people and, in particular, to educate them about a lifesaving drug: naloxone. Naloxone, also known as Narcan, is a medication that essentially reverses an opioid overdose long enough for a person to get medical attention. Many cities now equip police officers and other first responders with the drug. And a growing number of places around the country are working to make it widely available in the community. Early studies show that naloxone programs do reduce overdose deaths. Wen wants to blanket Baltimore with naloxone, and she's starting with those drug users themselves. The health department conducts naloxone training for inmates at the Baltimore City Detention Center. The department also offers naloxone training and a naloxone kit to every person who visits one of the city's needle exchange vans. This summer, Wen herself led the very first naloxone training inside the Baltimore City Circuit Court, for participants in the city's drug treatment court program. Health workers have also taken to the streets, setting up tables at spots around the city known for drug activity. The trainers are often familiar faces in the community and easily draw a crowd for the five-minute naloxone demonstration. There is a glass vial with the medication, a syringe, and an atomizer. Uncap the various parts, screw them together, and spray half the medication up one nostril and half up the other. At the trainings, there is always a doctor on hand to write prescriptions, which Medicaid recipients can fill for $1. On Aug. 31, to mark International Overdose Awareness Day, outreach workers had a new version of naloxone to give out. At a spot in Sandtown, eight blocks from where Freddie Gray was arrested, veteran health worker Nathan Fields demonstrated Evzio. "It's an auto-injector," Fields says. "It's very simple." Similar to an EpiPen, Evzio comes in a cartridge smaller than a pack of cards. Once activated, the device talks, telling you to remove a red safety guard, place the device against the thigh and press firmly for five seconds. Fields demonstrated the educational version on Dr. Wen before distributing kits to bystanders. The wholesale price for an Evzio kit, which include two doses of naloxone plus a trainer cartridge, is $575. There's no chance the health department could afford to buy Evzio at that price. Kaleo, the pharmaceutical company behind it, has just donated more than 3,000 kits to the city. The computerized Evzio trainer talks people through how to administer the heroin antidote in an emergency. The donation is a boon to the city, which has faced a price surge in the nasal spray version of naloxone. The price has nearly doubled since February, from about $20 a dose to close to $40. On the streets, Evzio gets rave reviews for its convenience. "This one is much better and easier to follow," says Andrea Towson. "I think this is a plus." Towson, whose street name is Teacup, has used heroin on and off for 33 years. She tells us, she's known in the community as someone who can help others get high, hitting veins they cannot. And she says she's known as someone who carries naloxone. She's used the antidote more than a dozen times, saving the lives of drug users around her. "I couldn't sleep if I thought I couldn't save someone's life. I just can't," Towson says. "An addict is going to be an addict, but it's still a certain kind of addict that still has morals and principles, and I like to pride myself and say I'm one of them." Wen says she knows that many will question whether giving naloxone to people like Towson promotes drug use. If there's no danger to overdosing, why wouldn't people continue to use? "But that would be just as flawed as saying that we can't give somebody an EpiPen for their allergic reaction, because that's going to make them eat peanuts or something else they're allergic to," Wen says. "There's just no evidence behind that at all." Wen's ambitions for naloxone extend beyond the city's drug corners. Earlier this year, she sent a letter to all doctors in Baltimore, urging them to prescribe naloxone any time they prescribe opiate pain killers. She's since heard from doctors worried about liability and the message they'd be sending to patients. On Oct. 1, a new Maryland state law takes effect that allows for standing orders of naloxone. That means a doctor won't have to be on hand at every naloxone training session to issue individual prescriptions, as is the case now. Wen plans to issue a citywide standing order for naloxone, essentially giving everyone in Baltimore a prescription for the medicine. She hopes that will make it easier to get the anti-overdose medicine into people's hands. In addition, a broader good Samaritan law takes effect in October, extending immunity to anyone who administers naloxone to someone who is believed to be experiencing an opioid overdose. "For everything that we're talking about with naloxone, as big a fan as I am obviously for it, that we're about to prescribe 620,000 people in our city with it, we know that we're just going to be treading water unless we have treatment that immediately follows saving someone's life."